Michelle Nocon was known as a front-woman of three pretty good doom bands – groovy Serpentcult, truly doomy Bathsheba and old school Death Penalty of Gaz Jennings (Cathedral). Her latest actual outfit was Bathsheba, but it has disbanded – they’ve played final gig on August 16th, 2018. Michelle did run her electro project Leviathan Speaks at the same time, so there was a chance that she wants to switch totally to this kind of music. There was also a chance of returning to doom metal paths. But instead she has chosen third way and thus Of Blood And Mercury experiment was born. 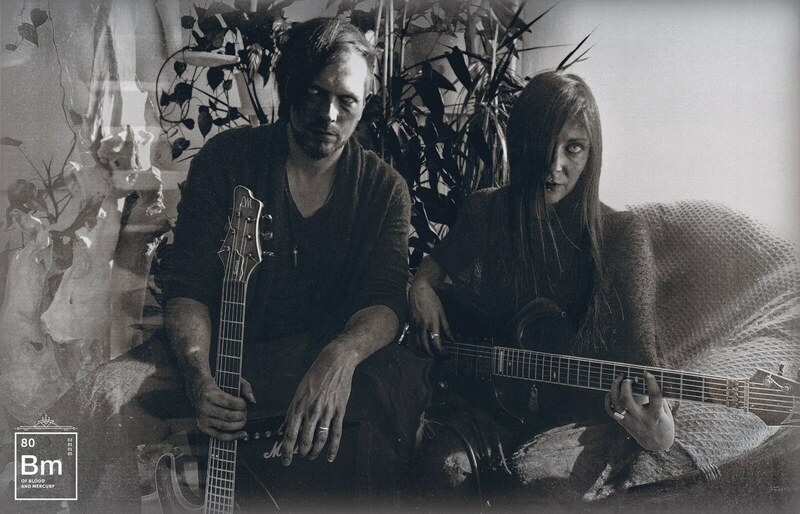 What kind of results gives a collaboration of doom metal singer and black metal guitarist? Have patience, Michelle is here to tell this story. Hello Michelle! So you have brand new debut of your new project Of Blood And Mercury, but let me clarify one thing – what happened with Bathsheba? Did you just bury it leaving no chance for resurrection? Hello Aleksey. Thanks a lot for having me. With Bathsheba we had a lot of fun and I think we did a great debut. We were full of energy and ideas, we were also on the same page… All from different angles putting all our personalities into one project. I’m very thankful for that time and I consider myself truly lucky. After four years, it felt things were changing. We were not all on the same page anymore musically, personally and neither what concerns ambitions. I think we somehow grew apart, leaving us unable to make songs which all of us were satisfied with. The writing process changed, we saw each other less and we just couldn’t find good compromises. There is no point in making music none of us fully likes, so the right thing to do I suppose is to quit then. As Bathsheba is no more and Death Penalty seems to be dead as well, you run two projects which have nothing in common with metal. Do you feel that you need other methods of self-expression at this stage? Leviathan Speaks started out as a black metal project and the upcoming EP ‘Make Hate Great Again’ will also be more in that direction. Let’s say that I admire that crazy creativity of an album like Mellow Gold from Beck. It’s crazy, brilliant and free. I want Leviathan Speaks to be a more arty project without limits, when it comes to music, topics, expectations,… I don’t want to set boundaries to myself. I did indeed feel like I needed other ways to express myself. Being in a band means that you work with a group. So you give part of yourself and you respect other peoples input too. That means that it will always sound different than if you would have done things on your own. Working in group determines the style, the notes, the rhythm, … I like that 4 different people make something great together. But I also felt the need to express different styles or approaches that were more personal. 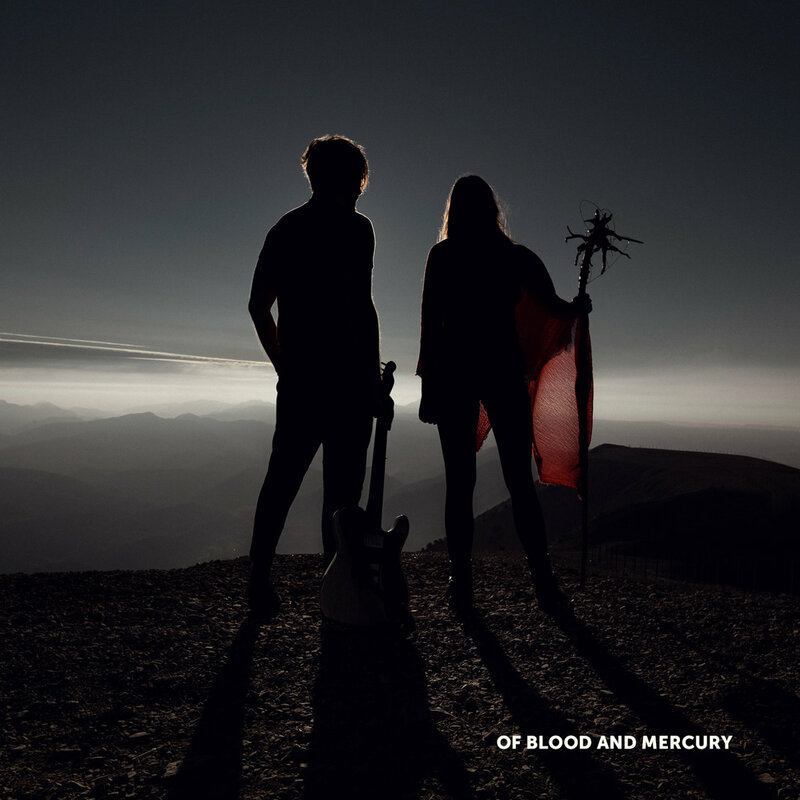 Concerning Of Blood and Mercury, I really wanted to start a pop project since long. Something that sounded still dark but more expressive in a calm way. Now I’ve found the right person to do it with. Olivier (Emptiness/ Enthroned) has a very wide musical taste and is a great composer. Whatever style, he will always put an eerie sound to it, which I love. What kind of ideas or feelings did you originally want to put into Of Blood And Mercury? What’s its concept? Both Olivier and me are people that worry too much (laughs). Olivier is also a painter and many of his paintings represent dreams of his. His dreams are always very strange, as if they show or explain some different kind of reality. Often it’s about the dissolution of the spirit. We have many talks about this topic. What is life really? We have biological facts, spiritual facts, now there’s talks about a simulation, … We like to leave room for speculation. We look at life with much respect, but always with sadness and doubt. It makes us often feel like strangers to this life. We try to transpose that part of ourselves in our music. You’ve started Leviathan Speaks project a few years before that. Was it difficult to switch to non-guitar based music? For me it wasn’t really difficult since I had no expectations, which doesn’t mean that I don’t have to be satisfied with it of course. I won’t consider myself being a ‘good musician’. I have no real good technical skills but I am very creative. It was just a matter of putting that creativity in a somewhat consistent context. I write a lot of music, with sometimes, very little consistency. So when I have enough of this or that, I put it together. For the ‘Make Hate Great Again’ I have a very clear vision of what I want it to sound like, as well as how to bring it live. So it will be a different approach there. For this one I will team up again with Olivier, since we work very well together and he really likes the freedom of that project. He will also be there for the performances. What did inspire you to start Of Blood And Mercury? Couldn’t you express similar message through Leviathan Speaks? Since long Olivier and myself wanted to do something outside of that extreme metal genre. Of Blood and Mercury is that something. We click very well on many topics, we are on the same page, we share the same ambitions, we are also a couple, so it’s great that we produce that together. Olivier pushes everything to the limit. When I am satisfied he digs deeper to perfect it. I’m a person of big lines, which works great for Leviathan Speaks. But Of Blood and Mercury could never be without Olivier’s picky character. What was on your mind music-wise when you started it? We were making this album with an open mind. The only thing we knew was that it wasn’t going to be a metal album. We both have a very varied musical taste. Bands or acts we love for instance are Slowdive or William Basinski. But I don’t think you hear anything of that in our music neither. We created 10 songs that are quite varied but consistent enough for an album. Some sound more like triphop, some more like ambient, some more like 80’s pop. We made our debut with a 3-song EP which people seem to be very enthusiastic about! What we definitely wanted to put in the music was that sad undertone we always share, and something ghostly, detuned notes, … I think it fits well with who we are. Despite its pretty minimalistic or rather laconic nature Of Blood And Mercury consists of four people, does it mean that you aim to live performances as well? As we speak our focus goes to finishing the album (we are recording the last 3 songs). In the meanwhile we are trying to figure out how to bring this music live. Olivier is taking care of that mainly. I’m very excited as I will be playing guitars on stage for the first time. We are starting to practise together and when the album is finished we will start practising with the whole line up. Then it’s time to look for gigs, we can’t wait to bring this live. We want that everything is well thought of, the music, the lights, the atmosphere between the songs, … I think the live performances will sound a bit more rock than the album . I’m very curious myself. What’s the Of Blood And Mercury line-up? Olivier and me are the main members. We started this project and write all the music and lyrics. We asked Jonas Sanders (Pro-Pain, Emptiness) to record the drums and David Alexandre Parquier (Luminance) to record the bass. Since we find them great musicians and very kind people we would like to have them there too for the live gigs. I think this line up will make it very interesting. Three songs EP isn’t enough for full live sets, do you have some new songs? We are recording the last 3 songs of the album right now. We are recording mostly in Blackout Studio in Bruxelles. Ivan houben recorded most of the vocals. The mix is done mainly by Olivier and Jonas. Peter Maher is our mastering man. He has worked with Jack White, Nine Inch Nails, Patti Smith, … Very kind and pro guy really. It will be a 10 song album, 3 of them are on the EP. The album will be called “Strangers’. For the EP cover and the album cover we went to a very special place with a desolated, moon-like landscape together with photographer David Fitt. It was quite a suffering as it was 2000 meters high at 6 in the morning, before sunset, so it was extremely cold and windy, but really worth it. I think we captured the right ambiance for the covers of both EP and album. “Life is suffering”, as a wise man once sad. Can you say that there’s an element/theme which connects Bathsheba, Leviathan Speaks and Of Blood And Mercury? I think “suffering” is definitely a common element. I seem to make sad music about sad things and I seem to be unable to do otherwise. Happy music mostly doesn’t touch me. “Life is suffering”, as a wise man once sad.